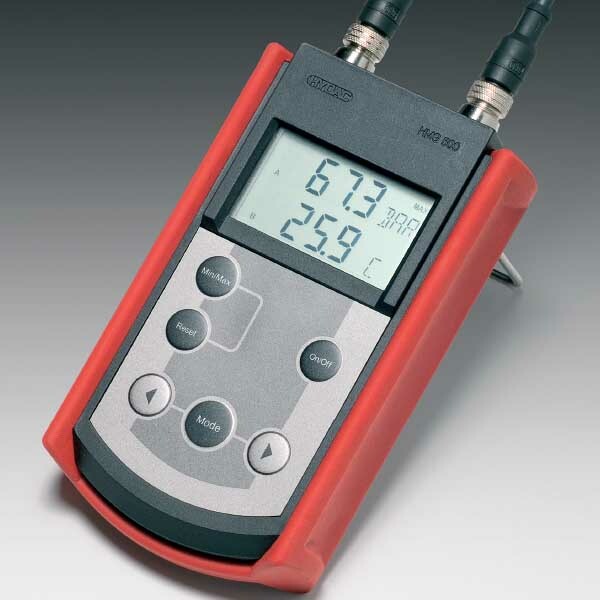 The HMG 510 is a hand-held instrument for simple measurement tasks on hydraulic and pneumatic systems in mobile and industrial applications. Compact and simple to use, the HMG 510 is an ideal tool for all those involved in maintenance, commissioning, and service. What’s more, a connexion up to two sensors with the HYDAC Sensor Interface (HSI) to the HMG 510 is possible. To begin with, the sensors are available to measure pressure, temperature and flow rate as well as sensors for condition monitoring (also known as SMART sensors). Some examples of SMART sensors are the HYDACLAB® Oil Condition Sensor, the AS 1000 AquaSensor and the CS 1000 Contamination Sensor. Indeed, the HMG 510 automatically recognises these sensors and takes all the necessary basic settings from each sensor. The display of the measurement values and the corresponding physical unit are on an easy-to-read LCD display. In addition to this, the HMG 510 enables upload on PC of measured values saved in the SMART sensors. What’s more, with the aid of the HYDAC PC software “CMWIN”, it is possible to display the measurement data stored in the SMART sensors on a PC screen. Indeed, these results will be in the form of a graph and therefore, available to analyse, edit and save. The HMG has a standard integrated USB port to enable this data transfer. Moreover, the HMG 510 has a function for setting mechanical pressure and temperature switches precisely and reliably.